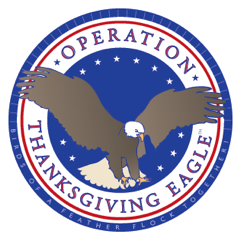 The mission of Operation Thanksgiving Eagle (OTE) is to thank children of the military for the daily sacrifices they make on behalf of our freedom. Through OTE, copies of the book It’s a Family Thanksgiving! are donated to children of the military around the globe. OTE also conducts pre-Thanksgiving educational events on military bases for children and their families and educators.